I'm so excited to be sharing my very first Christmas project of the season today. I've decided to go with a fabulous theme for decorating around my house this year: sparkle. 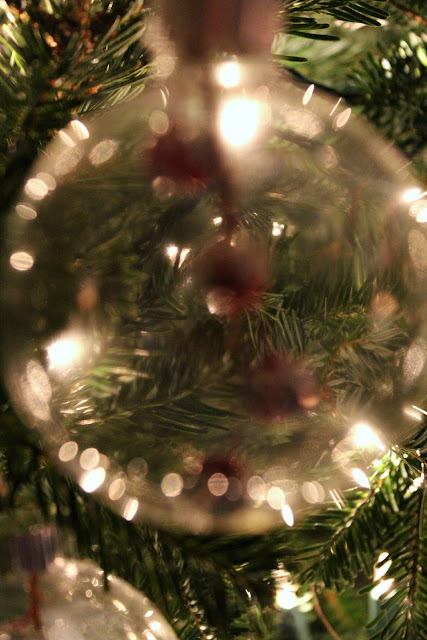 I'll be decking my halls with some shiny things, a lot of pizazz and a whole lot of glitter. 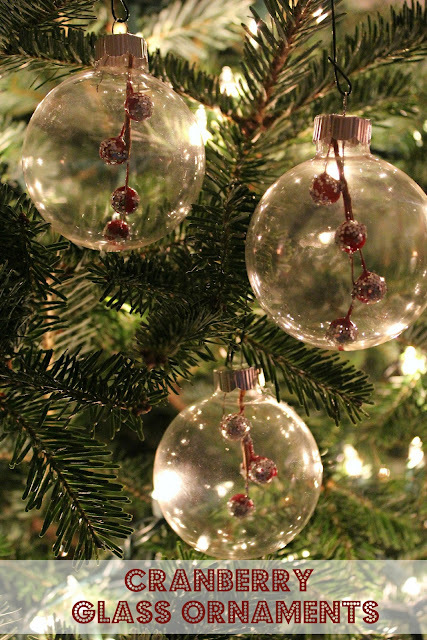 If you remember from my tree last year, I've got lots of fun sparkly ornaments to use. 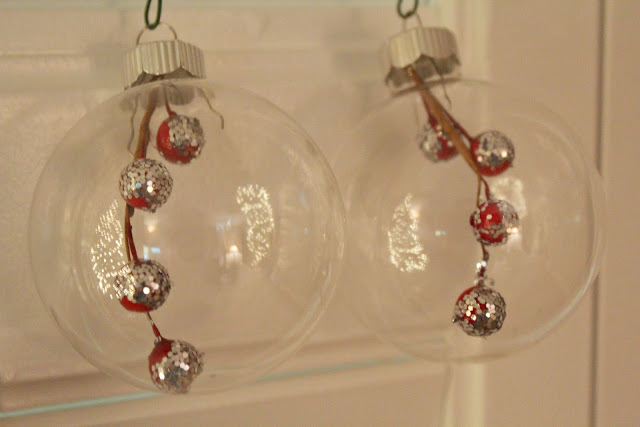 And when I saw these glass ornaments on sale for $2 at Hobby Lobby, I snatched them up, sure that I could add a little sparkle and call them my own. To be quite honest, my original thought was to paint a design on the side of the glass ornaments- a fun chevron, some quirky stripes, a few polka dots. Then I remembered that my free hand resembles something that a five-year-old would do, so I opted out of that plan. Plan B: stuff these guys with something (TWSS). Which is actually a better idea anyways, because I really like the idea of adding an extra 3D element to the tree. Hellooooo cranberries! 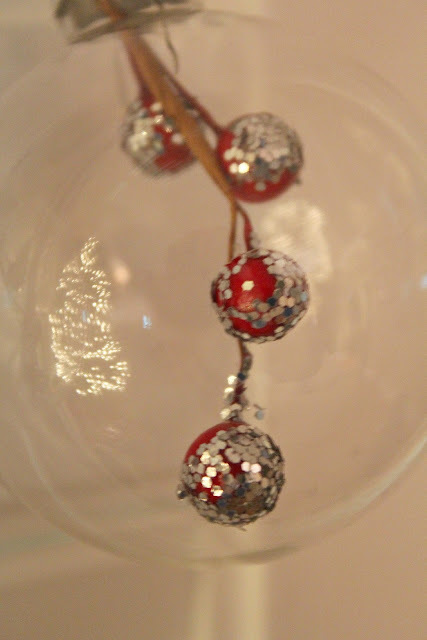 I simply cut some stems off of a cranberry bushel I found in the craft section at JoAnn's, doused them with glitter and then hot glued each piece to the silver part of the ornament. How cool is this shot through the ball? Ooooh, fancy photo skillz. So there you have it! My first Christmas craft of the season. Now tell me all about what you've made so far this season? 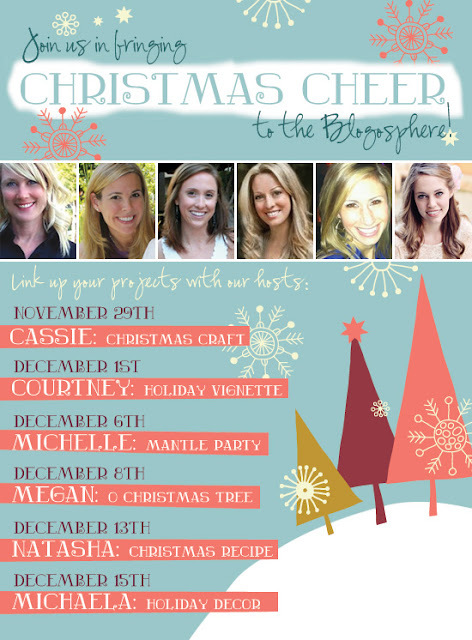 And, more importantly, head over to Cassie's blog, Hi Sugarplum, to link up and share your holiday craft! She's got a big link party going on, so head on over to join! 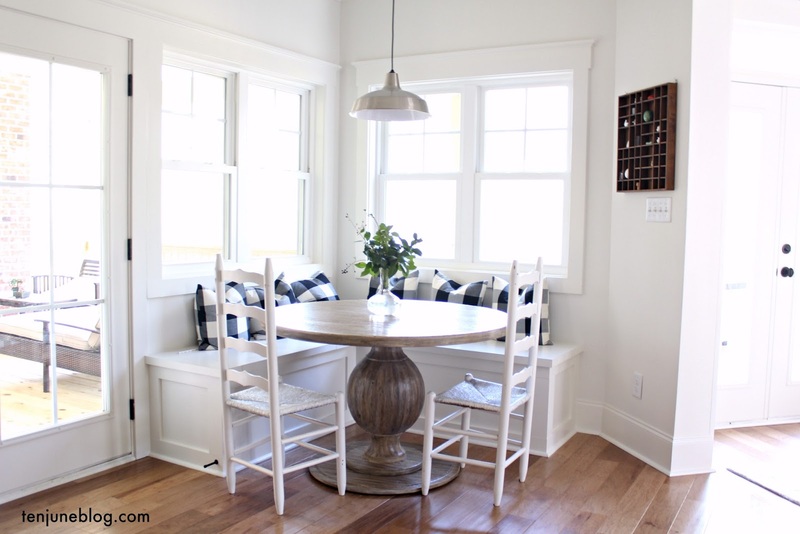 I'm also linking up with Sarah at Thrifty Decor Chick, Kate from Centsational Girl, Katie from Bower Power, Stephanie from Under the Table and Dreaming and Beth from Home Stories A to Z. You can also visit Michaela Noelle Designs, A Thoughtful Place, Honey We're Home and Schue Love to see more holiday crafts today! And I hope you've got your holiday decor ready for Thursday, when we share and link up Christmas vignettes over on Courtney's blog. those are so pretty! i love the simplicity and the sparkle! These are really cute! 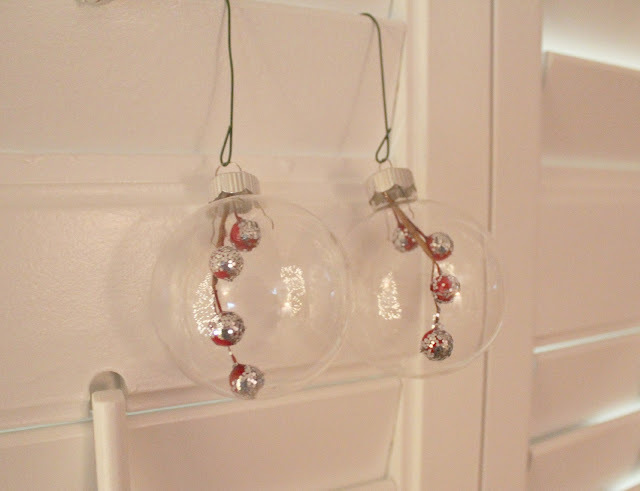 I love all the things you can do with those clear glass ornaments. These are super cute and look so expensive! I might be hitting up my hobby lobby to see if I can replicate! Thanks for sharing! So creative and looks amazing! These are darling, Michelle. My daughter would love helping make these. Cute post. These are too cute! At first glance, I thought you'd painted the cranberries on the side. But the 3d effect is even better. 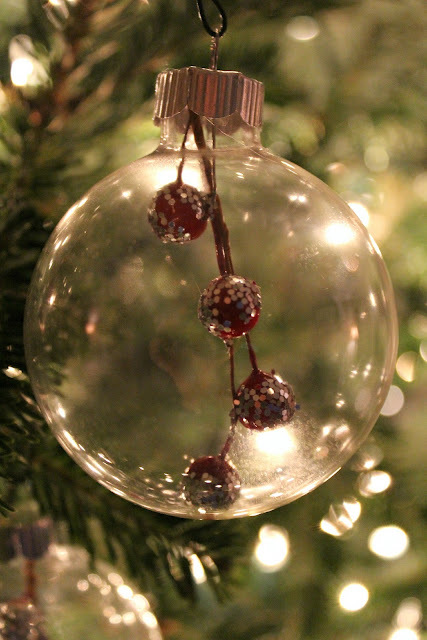 You, me and Natasha were playing with balls this weekend...er, ornaments. The kids and I painted some for our tree too. Sparkle is a wonderful theme for the holidays! I haven't started my holiday crafting yet, although cards & ornaments are in my plans. Your cranberry ornaments are so pretty!! These boules are ADORABLE! I love that they are so "simple" and yet so elegant. I'm not much of a crafty soul myself, but I could be convinced to give this project a try. Love those. Great idea and SO simple! These are so cute Michelle! So simple, but definitely gives it that glitz you're going for! Those are lovely! They look so modern and crisp. Love how simple and sparkly these are! Great idea, M! 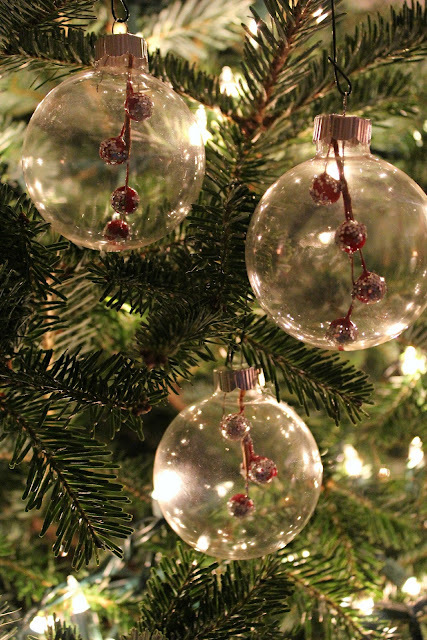 The glass ornaments are very Christmas. Yes that's how I describe it. It's the first words that cross my mind when I look at the photos. Super cute idea!! Thanks for the DIY. Simple and perfect. That about sums it up. Can't wait to try! those are so precious. love them!